There are few better ways to recharge batteries than a weekend of wandering on the hills of the Lake District, Snowdonia or the Highlands. What's more, this balm for the soul is accessible to everyone. But despite its simplicity, there are some things you need to know to go hill walking safely and comfortably. Luckily, on our mountains and moors a little bit of knowledge goes a long way, and the rewards in terms of health, wellbeing and happiness will last a lifetime. Whether you’re just starting out or are looking to take your skills up a notch into scrambling or winter mountaineering, we’ve put together some of the most useful articles on the BMC website into this handy list. Researchers have concluded that walking is better for you than going to the gym. Here's why. Five tips to get you started in the hills and mountains. Some tips for taking your four-legged friends with you into the hills and mountains. Your first walk in a hill or mountain area is an experience you will almost certainly remember. But poor planning or bad weather (or even a closed tea shop!) can quickly ruin things. Here are some tips to prevent that happening. The increasing number of hill walkers being rescued after relying on smartphone apps for navigation has prompted a rash of negative newspaper headlines. Ed Douglas discovers there’s no substitute for a map and compass. Trekking poles are invaluable to reduce stress on joints and preserve the health of the body over a lifetime. Here are some tips on using them. Being able to read a map and find your way around the hills is an essential skill for all mountain users. Here are some pointers to help demystify what all those lines mean. Most people will experience blisters at some point in their pursuits. Find out what you can do in this short article. Each year there are reports of people who have been attacked by cows whilst out walking. A few tips to avoid becoming a midge meal, or worse. Bad weather doesn’t have to mean a bad time. Here are five tips for making the most of awful conditions. Here’s the other end of the weather scale. Heat and sun are unusual hazards in our mountain areas, but it’s worth debunking some of the myths around exercise in hot conditions. Are you sorted for your scrambles, or do you think a skinny single comes from Starbucks? Time to rope up. A scripture-inspired guide to surviving and thriving in the British hills as a walker in winter. Go forth and play. Micro crampons or mini spikes have become a popular alternative to walking crampons with many winter hill walkers, but do they offer enough security for the changeable ground conditions found in our winter mountains? Discover what the experts think in our article, and make up your own mind. Seven suggestions to help you get started walking in the hills and mountains. Catch a glimpse of the Alps in Wales, see a mysterious double sunset, and climb the Yorkshire summit said to be more impressive than K2. Pointy mountains aren’t just a thing of the Alps – we have plenty of them here in Britain. Here are six of the best places to go for a weekend of nerve-testing scrambling. Mountains have always meant more to humanity than just lumps of rock. We take a look at five summits with mysterious, magical or mythological significance. Four of the best night walks to enjoy, particularly at the winter solstice – the shortest day of the year and the astronomical beginning of winter. In December 2015, Snowdonia was officially crowned the world’s tenth Dark Sky Reserve. In celebration of this event, we go through the best way to experience the national park in all its starry glory. From famous mountaineers to mere mortals, everyone seems to have a soft spot for the ‘people’s mountain’. Here are five reasons why you should climb Blencathra. A calendar of easy family walks giving you the chance to spot the best British wildlife spectacles year round: breeding puffins to red squirrels, reindeer to sea eagles, otters to dolphins. The mountains at night can be hazardous, but also wonderful. Carey Davies gives some tips for exploring the dark side. What’s it like to experience Scottish winter hill walking for the first time. And how easily could you get up onto the high ground in the snow? Chris Townsend is one of the world’s most respected experts on long-distance walking. In this 'how to' interview, he offers tips for getting started with extended hikes. Three week-long route ideas for beginners, offering a mix of nature, history, solitude and challenge, plus Chris Townsend's top tips on getting the most out of the adventure. Scrambling is the wobbly grey area that nestles between hiking and climbing. Whether you're hands-on-rock, or prefer to trudge up hands-in-pockets, it's a fun and faff-free way to tick off a summit. Here's how to make the step up, with top tips from instructors and experts. Scrambling aficionados offer their top reasons why you should give it a go, plus three favourite routes to whet your appetite. A great 28 page booklet covering essential skills for trips into the hills and mountains. 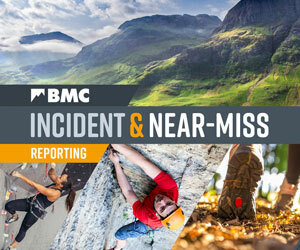 Download it or order it from the BMC shop completely free. Essential skills and techniques for hill walking. Follows two walkers, Fredelina and Ben, on days out in the British mountains. See how they prepare for their walks, the challenges they face and the decisions they make. Want to learn all the skills you need to be a confident hill walker at a bargain price? The BMC's courses include 'Head for the Hills' courses, affordable hill walking weekends for beginners at the famous Plas y Brenin mountain centre in Snowdonia, as well as more advanced courses in scrambling and winter skills. The BMC's partner organisation Mountain Training has just launched its new Hill and Mountain Skills Courses. They aim to equip you with the basic knowledge and safety skills required to participate in hill and mountain walking in your own time and are run by providers all over the UK.